Woolworths opened their second Blackpool store in 1928. The first one was Store 66, by Blackpool Tower (opened in 1916). This one was nearer the South Pier side of the seaside, on the corner of Bond Street and Waterloo Road. From this photo we can see it was a large store with many entrances. It closed in January 1994, and it became a Home and Christmas shop called Hartes. The building is up for sale at the moment. 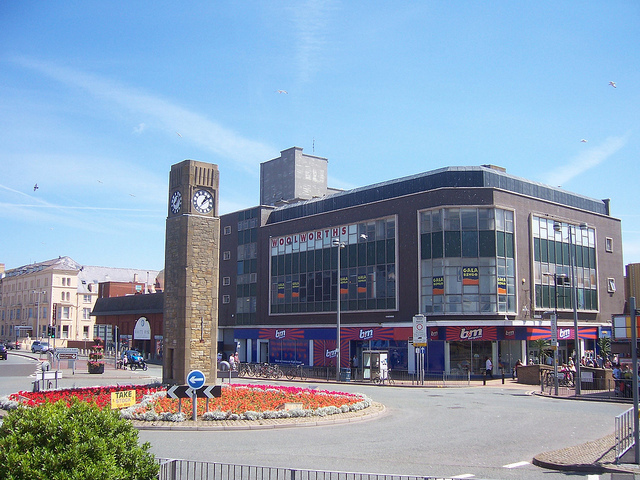 On 10th March 1928 Woolworths opened in the seaside town of Rhyl in North Wales. It was on the High Street, a small single-storey store. They extended on 23rd May 1931. Below is a photo of the store in 1953, when there were Coronation celebrations for the Queen. Interesting that the store had a very large Woolworth fascia above the first floor. Woolworths moved from here a few years later. The building still exists today and it is a Shoe Zone Factory Outlet store. On 17th May 1974, the store was modernised and converted to self service. In 1987 it was refurbished to become a comparison store (without the restaurant), re-opening on 3rd April. In the 2000s, the store became a 10/10 store, which you can see in the below photo. Although it looks closed in the below photo, Woolworths had in fact covered the windows in blue, presumably so they could put shelving up against the windows inside – but not looking so nice from the outside. It was a smaller store now, as the top floors were now occupied by Gala Bingo. 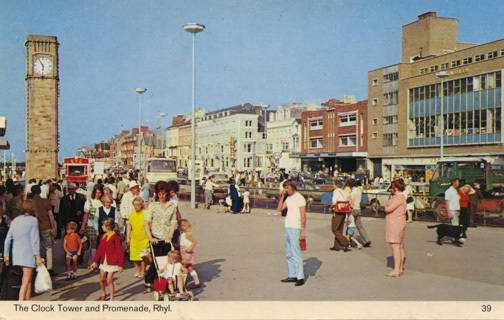 If you enjoyed this, I also found the history of Rhyl Marks and Spencer online (now Poundland). Written by Rhyl History Club, it’s quite fascinating – read about it here. This post was originally written in 2014. In the early 1960s, the store was extended to nearly double its size, and the front fascia completely remodelled. After the makeover, the store front didn’t change much in appearance over the years, although it did have a series of extensions at the rear. 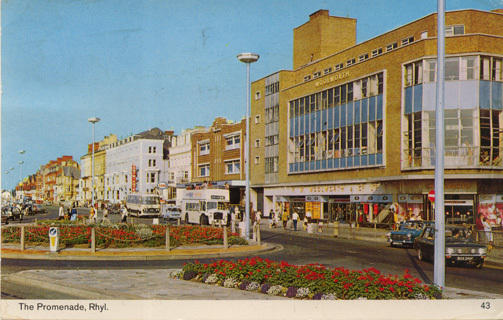 Below is the store around 1965, with Burtons on the other side. We can see how traffic is building up here. 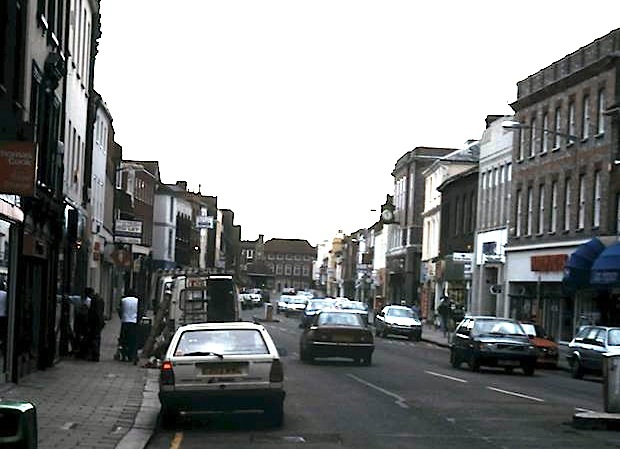 Source: The Changing Face of Newbury – Higgott, T.
Here is the store in the late 1980s, before the street got pedestrianised in 1998. Newbury Woolworths closed on 30th December 2008, after 90 years of trading. 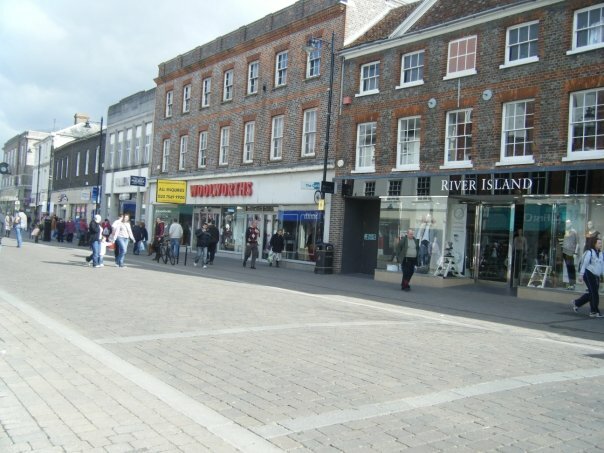 Here is a photo from when I visited the town in March 2009. From these photos you can see the buildings have not changed since the 1960s, and the M&S clock is still standing (needs a new battery though) – Northbrook Street has a lot of listed buildings, making it very picturesque. Today it is a Wilko – I went inside and it was just like walking into Woolworths. The aisles and pillars are the same as before, and the store seems to go on for miles! There’s a back side entrance that leads on to a car park and the back of Camp Hopson. It is nice to have a replacement that does remind you of Woolworths. Woolworths opened their third Cornish store in the coastal town of Falmouth in 1928, the others being St Austell and Camborne. The Falmouth store was a small one on Market Street, which is literally on the coast. See below the original store with the recognisable Woolworths facade. At some point the store was extended to the left, and a new Art Deco style facade was put up on the upper floors. Here is a close-up from the late 90s, with a very simple style of window poster advertising 3 for £20 selected CDs and 3 for 2 on all Chad Valley toys. The store lasted until the end, closing on the 30th December 2008. The store remained empty for a while, before becoming a Wilko. But look up and you’ll see some Woolworths Art Deco architecture. 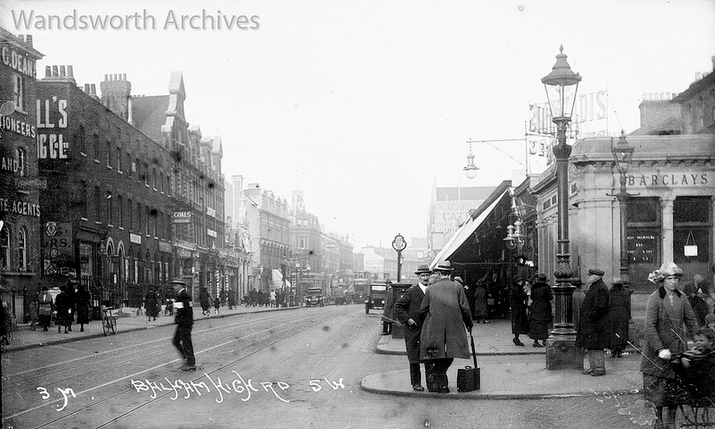 Woolworths opened on Balham High Road in 1928. It took over the premises two doors down from Barclays Bank, which you can see in the below 1915 postcard. In 1940 during WW2, a bomb hit Balham High Road in front of the Woolworths store, hitting the Northern Line Tube Station platform below. A bus crashed into the crater. 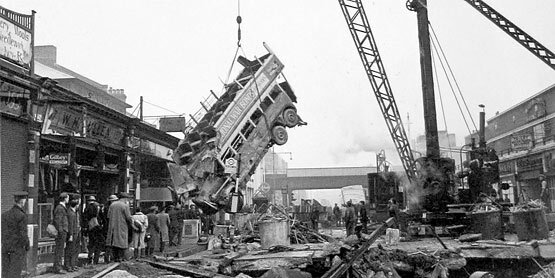 Here is a photo of the bus being lifted out – behind the bus would have been where the Woolworth store was. Below is a great photo from 1974, showing Woolworths with it’s 70s fascia. This shopping parade is quite unique as it appears to have houses above each store to the rear. In 2000, the store was one of the first to be converted to a Woolworths General Store, which offered a pharmacy, health & beauty products, general merchandise and convenience food. Balham was a pilot, renumbered to store 2002, with a Superdrug pharmacy moving instore. The General Store format didn’t do well, and it went back to a normal Woolworths store some years later, before becoming a 10/10 store. A more recent photo, this is shortly before Woolworths closed on 5th January 2009, window displays not looking as great as they did in the 1930s. That same year, a 99p store opened in its place. They were taken over by Poundland. More recently (in 2019), the store has become the first ‘Aldi Local’ in the UK – it’s a smaller style Aldi that doesn’t have the middle aisle! Woolworths opened their second Cornish store in 1928. The first one was at St Austell (Store 291), opening in the previous year. It was a small store with a traditional frontage, that was extended to the left side over the years. These are some photos of the interiors from the 1950s/60s. Look at the ‘Pick ‘N’ Mix facing the entrance – I can only imagine how colourful this must have been. Departments were still separate wooden counters at this time, with a Woolworths girl in the middle of each counter. Here is a close up of paints and lighting. In the foreground looks like beach inflatables, as Camborne is close to the Cornish coast, St Ives being the nearest beach that would have had lots of visitors. Here is a close-up of the fascia on a snowy January day, the windows advertising the January sales offers. There isn’t a date on this photo, but taking a guess from the style of the traffic light crossing and the fact that there is A4 POS in the doors that had to be printed in store, could this be from the 90s? The store lasted until the end, closing on 5th January 2009. There is a video on YouTube with a closing speech at the store. The store became a Poundstretcher, which it still is today. If you are ever in Camborne and are walking past Poundstretcher, take a look above and admire the Woolworths architecture. Woolworths opened their second Isle of Wight store in Newport in 1928. This first one opened in Ryde the previous year. The Newport store was originally at 104 High Street, as pictured below. 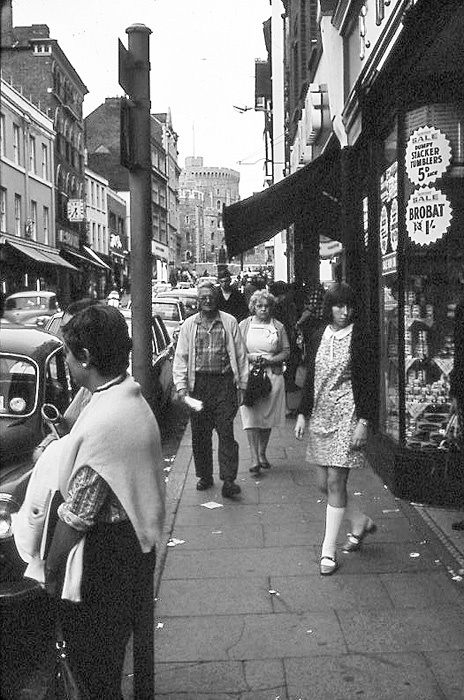 Some time after 1972, the store extended into the neighbouring building, so it spanned from 103 to 104 High Street. The store lasted until the chain went bust in December 2008. The unit was split – 103 is now Card Factory and 104 is Poundland. The Woolworths tiles at the sides are still present. Woolworths opened in Poplar, East London, in 1928. It was on Chrisp Street in a small purpose-built store. It had an unusual shopfront with square windows. By 1939 the store had been extended to the right. 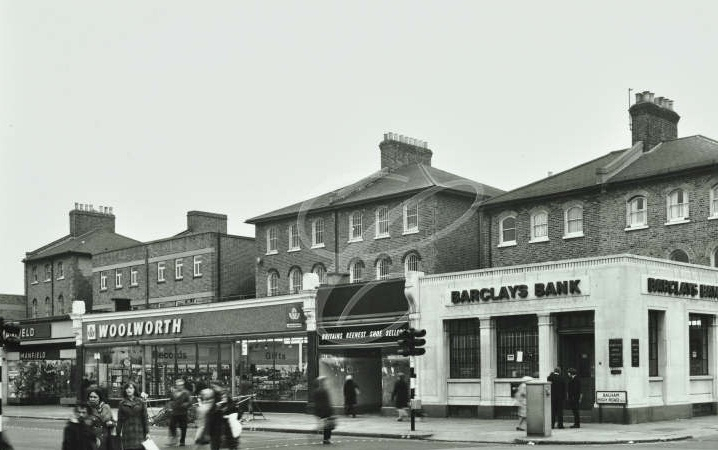 In the 1950s Woolworths moved to Vesey Path which was built parallel to Chrisp Street. It was in the Lansbury Estate that formed part of the ‘Live Architecture Exhibition’, built as part of the Festival of Britain 1951. These photos have been supplied by Tony Cue. They were taken in 2006 when the store reopened after a 5/5 refit. The store closed in December 2008 and it became an Iceland. Woolworths opened in Market Harborough on the site of an old motor garage at 19 High Street in 1928. The garage was demolished and the Woolworths store was built in their recognisable style. They traded here until the 1970s. Today a Savers store trades from this site, which opened there in the 2010s. You can tell it was a Woolworth store from the style of the upper floor and the tiles. 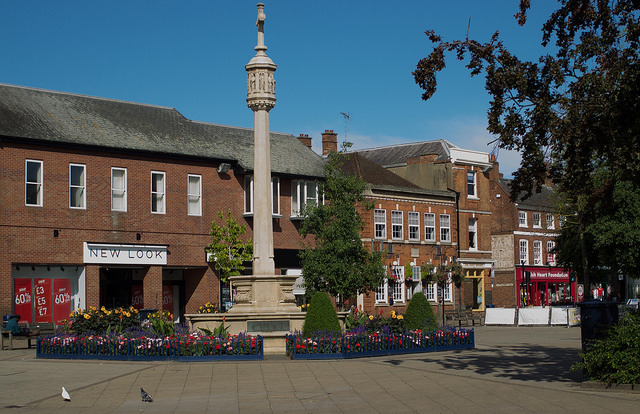 Woolworths relocated to 43-51 The Square, which is just down the road from its first location on the High Street. You may notice that the Woolworths logo is different from the usual. This is because this was a 10/10 store, where a new look was trialled in 2002/03. 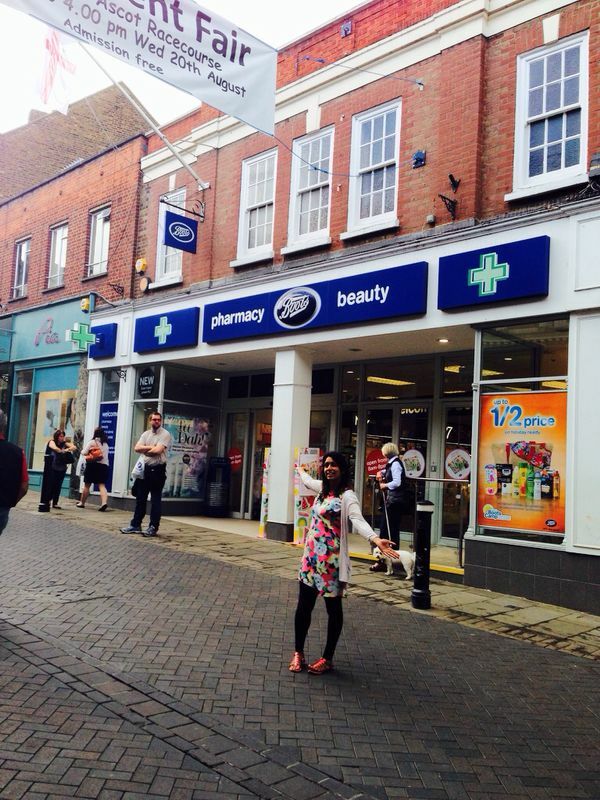 Market Harborough was the lucky store that got chosen to try out the new design for the smaller stores. Unfortunately it didn’t work as well as it did in the larger stores – the store became too congested and customers found it hard to get to the back of the shop on busy days. So the design wasn’t rolled out to the rest of the small Woolworths stores. In late 2009 it became a New Look, which it still is today. 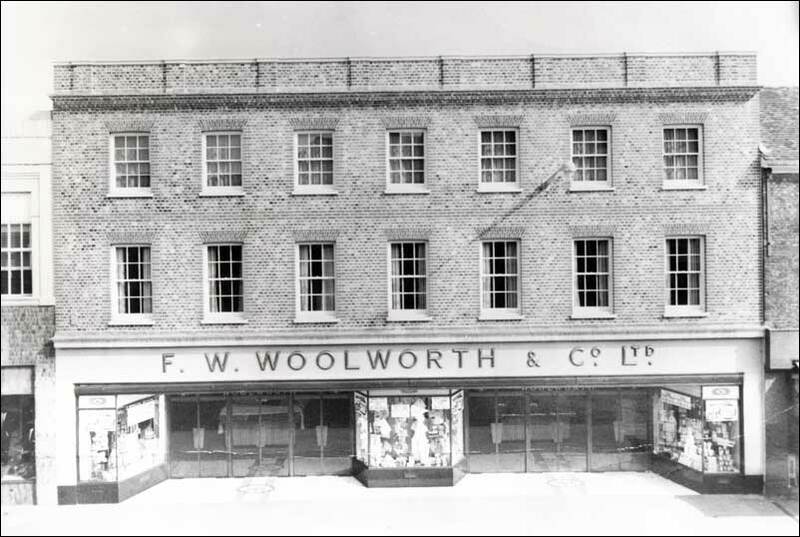 The 300th Woolworths store opened in 1928 on Penkhull Street in a timber-framed building. At some point Penkhull Street was renamed ‘High Street’. 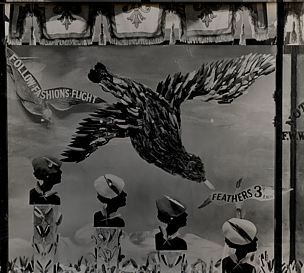 After WW2 the ‘3d and 6d’ was dropped from the fascia so it read ‘F. W. Woolworth’. In the 1950s a zebra crossing was put on the road directly in front of Woolworths. In presumeably 1960s, Woolworths had a major makeover. They demolished the original timber-framed building and built a two-floor superstore that took the whole of the corner plot. It went all the way to the other end of Friar Street where there was another entrance. In the 1970s, the logo was updated on the fascia. The store lasted until the end, closing in January 2009. After closure, it became a 99p store when then became Poundland. 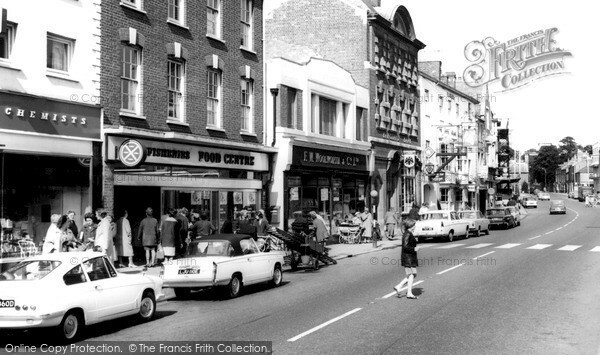 Here is the side view on Friar Street, so you can see how big a Woolworths it would have been. The store was extended later on, to take on more of that terrace. Sadly this building was hit in 1942 during WW2. Woolworths rebuilt the store and reopened on 14th October 1955 – this photo was taken shortly after this date. It was the first Woolworths store to have the curtain walling style. On the right side you can see a space for another shop. Below you can see a shop has moved in next to Woolworths. In the 1970s Curtess shoe shop is next door, and in this close-up of Woolworths you can see the mosaic floor tiles at the doors. The store closed before 1995 as it is not on that store list. It became Brubakers according to locals. Today it is Iceland, and it looks like the Woolworths curtain walling has been painted a lovely shade of cream. Woolworths opened in Sittingbourne, Kent, in 1927. It wasn’t a purpose-built store – the building was part of the existing Rose Inn according to the internet – though from these 1955 photos The Rose is still there on the left of Woolworths, and there is an alleyway between the two buildings. The windows are certainly the same – Georgian sash windows. Here you can see the store in the 1990s with the more familiar logo and tiles. In 2008, you can see the doors have been updated from the ones above. 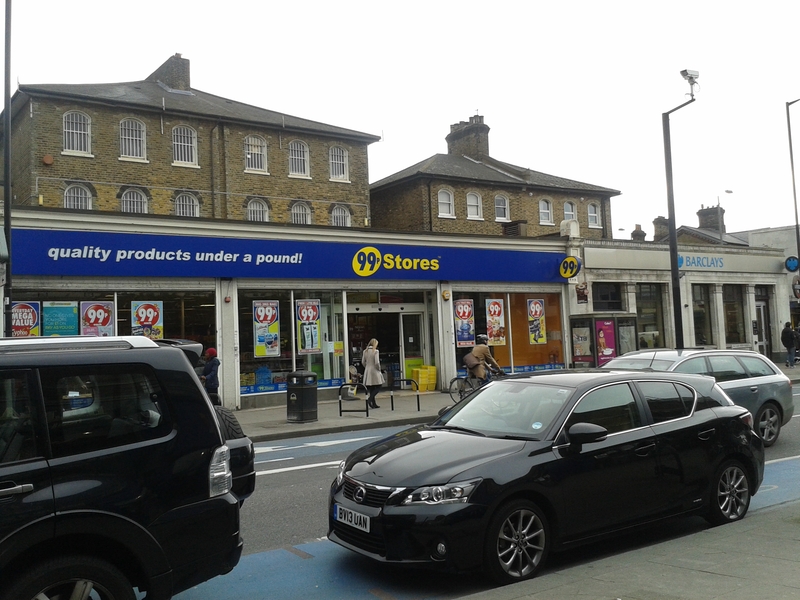 The store closed when the chain went bust in December 2008 and it became a 99p store, who were bought by Poundland. But walk past this store and you will know it was a Woolworths. 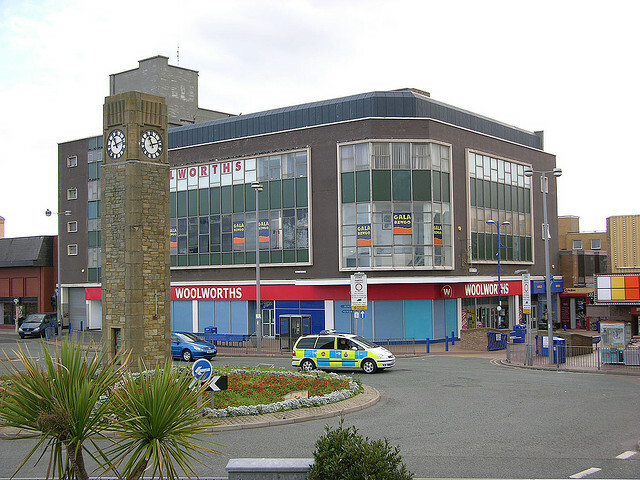 Woolworths opened in the Welsh town of Maesteg in 1927. It was on Commercial Street, next to A E Lockyer & Son. This is an early staff photo sent in by Richard Northover. The photo was sent to his late father (who was store manager in the 1960s) by a long retired District Manager called Keith Doel. He also has a copy of the 1934 Pictorial Record, showing Mr Barclay being the store manager in 1934. In that edition, it says there were 600 stores, of which 2% of the store managers were ladies – Woolworths at the forefront of equality! Below you can see the front of the store, possibly from the 1960s – I am guessing from the style of the cars. Next door you can see Lockyer’s and in between Woolworths and Lockyer’s was an alleyway leading to a snooker hall. Below is a staff photo from 1968, when the store manager was Terry Williams, who took over from Mr. Northover. Former employee Louise Jeffery shared some 90s photos on Facebook page Maesteg Memories and you can read lots of happy memories of the store on that page. What I love about this photo, apart from cool Auntie Pam being Santa, is seeing the products on the shelves, and the SALE point of sale. The store lasted until the end, closing in December 2008. It became a shop called Richleys Stewarts for a short while, but today it is Peacocks. It is interesting if you compare with the black and white photo above, there used to be little half-windows just above the fascia. Next time you are shopping in Maesteg Peacocks, now you will know you are in a former Woolworths! Woolworths opened in Catford in 1927, on Rushey Green. At some point it was extended to become a large L-shaped store, with a side entrance on Holbeach Road. From the front there was a coffee bar on the right as you walked in. 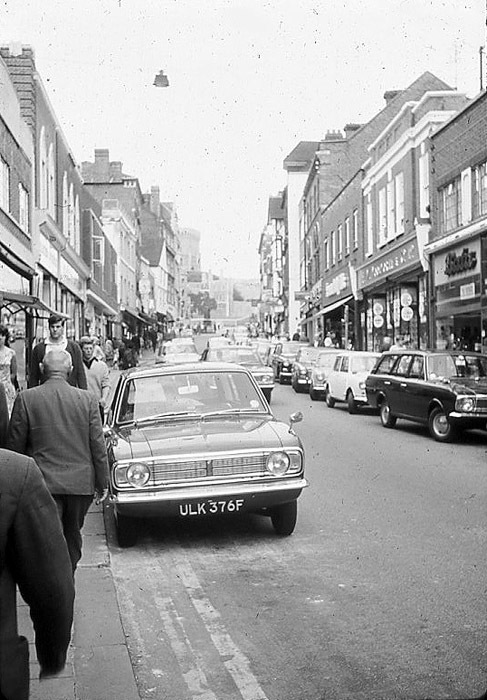 The below photo was taken in the 1960s when a church service was taking place in front of the store. Look at the beautiful detailing on the windows. The store closed down in 1985. Today the Rushey Green side is occupied by Specsavers and a betting shops. As for the Holbeach Road side, the back of the former Woolworths is part of ‘Catford Mews’. It looks like the back of the recently closed Poundland was the Woolworths side entrance. 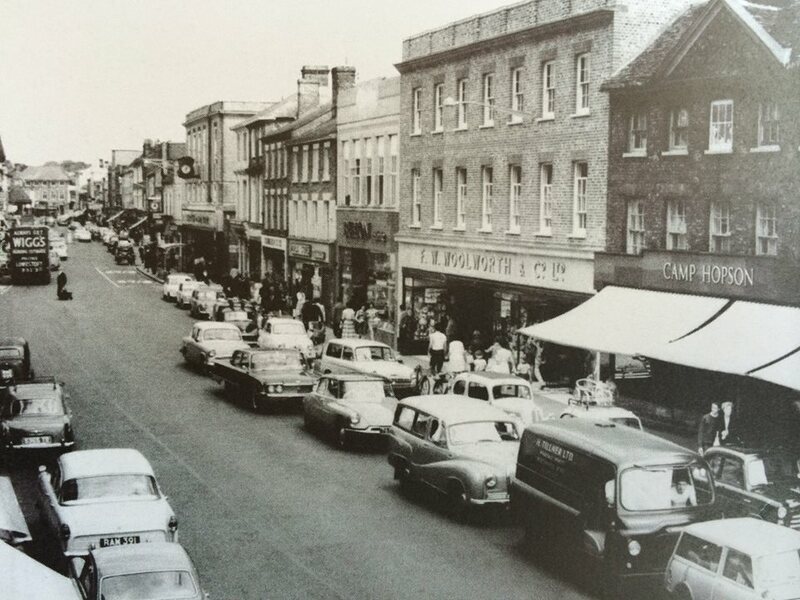 Below is a picture from 1968 – Woolworths is on the right hand side, next to Bata shoes. Close up of Woolworths above, with ‘Sale’ sign on the door advertising ‘Stacker tumblers 5d each’ and ‘Brobat’ reduced to 1/-. Where the 60s ladies is walking is exactly where the man is standing in the Boots photo (see at the end of this post). Above is the store in August 2008, still trading, before it finally closed in December that year. Today it is a deceptively large Boots, with perfumes along the narrow front section of the store, leading on to a huge floorspace at the back. I read on a forum that back in the 60s when this was Woolworths, shoppers liked to go to this part of store to escape the fumes from the buses. Apparently M&S and Woolies were best for escaping the pollution. 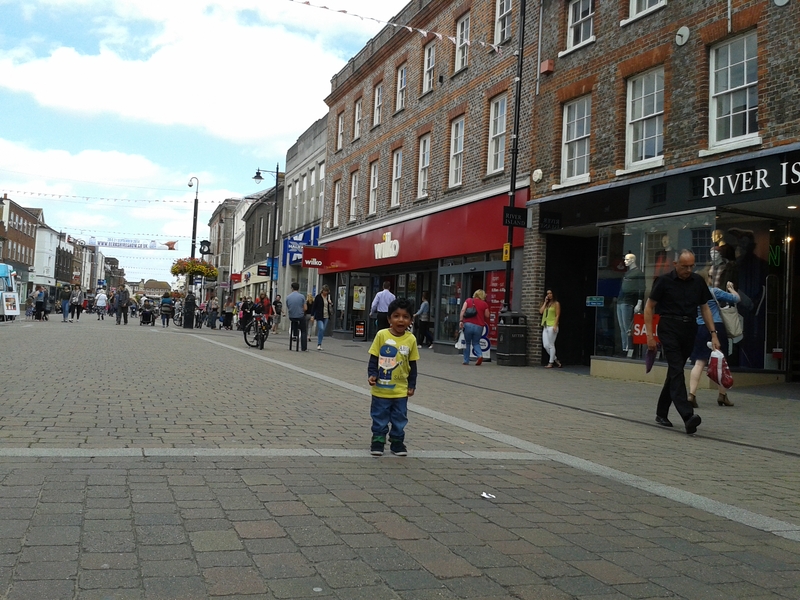 Good thing it’s all pedestrianised now. Also I like how Boots have kept the little flagpost that used to hold the Woolworths Cafe sign. 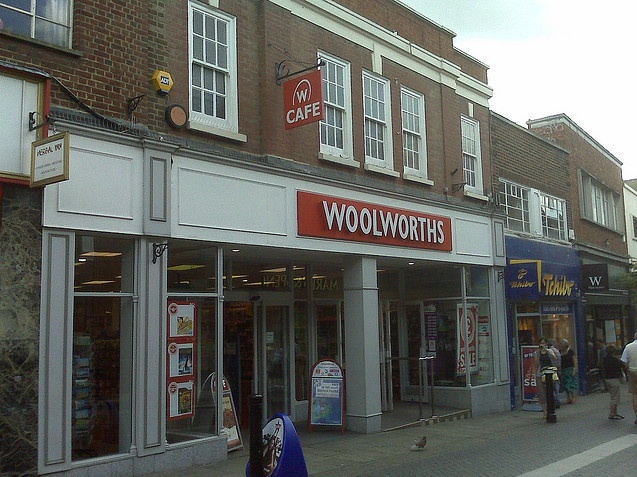 Woolworths opened in Grays, Essex, in 1927. It was on the High Street, very close to the railway station. Below are some photos of the store over the decades. In the 2000s it was converted to a general store with a new store number of 2022. After closure in 2008, it became a Thurrock Health Centre – something different for a former Woolworths. Woolworths opened in Green Street, East London in 1927. Historically Green Street is the road that divides East Ham from West Ham. There isn’t much information the Woolworths store, but from the address we know it was very close to Upton Park tube station. Green Street was heavily bombed in WW2, but we have no information as to whether Woolworths was hit. From the style of the building today, we can guess there was a 1950s makeover. The store closed in February 1994, and today it is Peacocks. But look up and you’ll see some Woolworths architecture. Woolworths opened their third Brighton store in 1927. 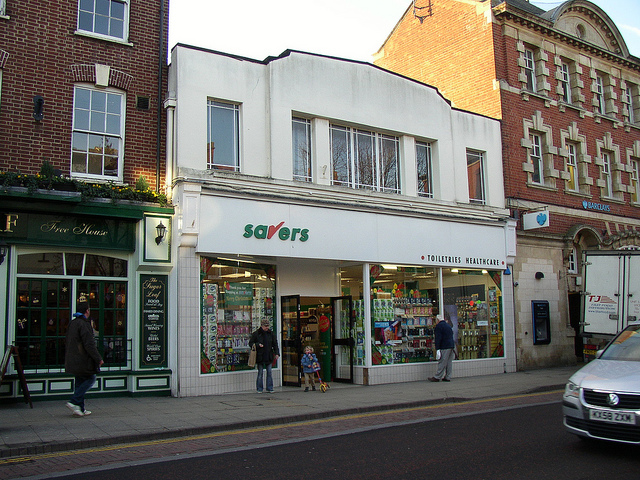 The other two were Store 73 (Western Road) and Store 288 (London Road). This store was on St James Street, pictured below. It was on the side of Brighton nearer to the Palace Pier on the beach. In this 1931 photo you can just make out the poster saying “Xmas Cards”. In the 1950s the store extended to the left, taking over the old Dairy shop. The upper floor had the curtain walling look. In either the 1960s or 70s, the store halved in size and traded from the right side (26 – 28a). We know this because this is the address listed on the 1972 store list. 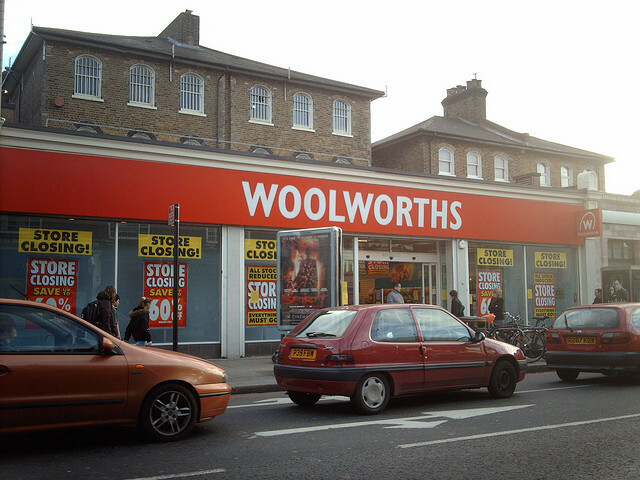 This Woolworths closed down in June 1986 – another casualty of the Kingfisher takeover. They decided to close branches where there were two in the same town. 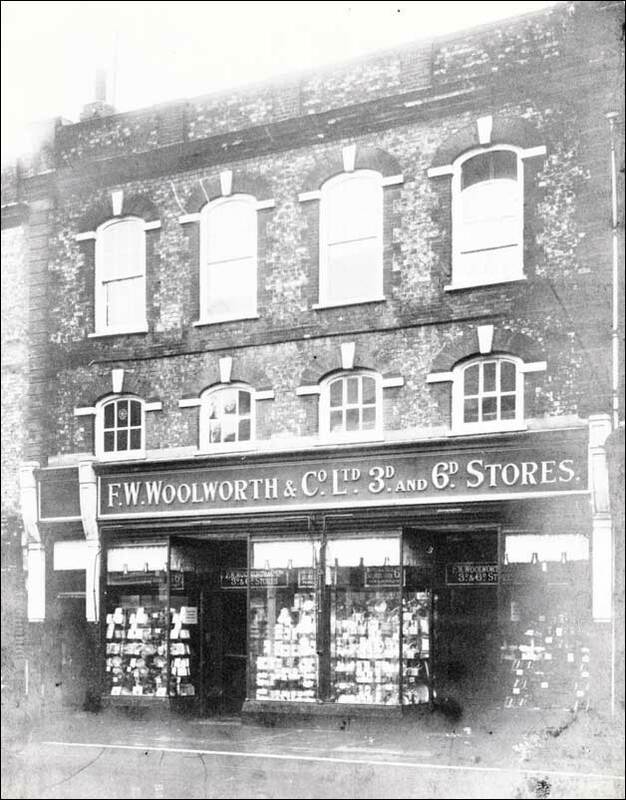 It probably became Superdrug straightaway as they were part of the same group – and you can see the Woolworths tilings around the windows and entrance. The left side was a Tesco express from around 2012 to 2016. Very recently, the upper floor was taken down and new apartments were built on top. Tesco moved out, and just this year a new Starbucks opened. There is no trace of it being a Woolworths now, even the mosaic tiles around Superdrug have been updated. Well, perhaps that white door on the right is from Woolworths days – it looks a bit old! Woolworths opened their first store in Cornwall on 12th November 1927. It was a small store in St Austell on Fore Street. On 18th October 1940 St Austell’s Great Fire happened, when eight shops and a café were destroyed, and five others including Woolworths and an inn were badly damaged. See below, Woolworths is the white building in middle left, with the ladders up against it. The store was extended in 1951, and then again in 1958. These are some photos of the interiors from 1958 – note the newly refurbished counters, the terrazzo floor tiling and the fluorescent lights. St Austell Woolworths Staff Photo – date? On 25th September 1970 the store was modernised, converting to self service. Though I think the change in the look of the building happened in the 1950s. Note the fascia being updated to the experimental large typeface, all in upper case letters. In 1980 it was again modernised with further works and a full refurbishment in 1982. Former employee Andrew Ellis started his career at Woolworths in St Austell, starting in 1982 in the stockroom. The manager was Ray Pipe, and Val Rowe was assistant manager. They used to open late on Tuesdays, as they had a team meeting on Tuesday mornings. He also says they hosted rock legends Prefab Sprout, Don Estelle and Windsor Davies. The store was refurbished again in 1994. It closed for good on 27th December 2008 after 81 years of trading in St Austell. Today it is a Poundland, but you can still see the 1950s Woolworths architecture on the first floor, as well as the tiled pillars and original Woolworths doors. Woolworths opened in Congleton in 1927. It was a small store with a typical Woolworths look to the first floor – see below. Source: Congleton Through Time, Alcock J. 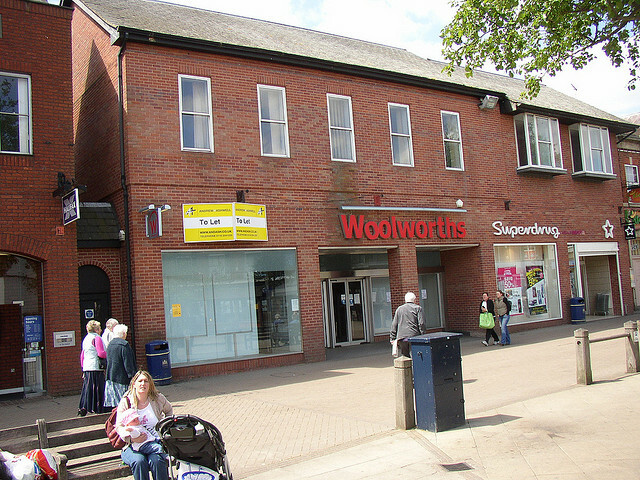 According to the Warrington Guardian there were three trial franchise Post Office stores, and Woolworths decided to end the trial in 1999. 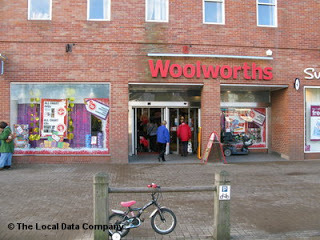 The store continued to trade well as a normal Woolworths, lasting until the end. It closed in December 2008. Shortly after closing, B&M moved in and they are still trading there today.